System Guardian provides real-time data security. System Guardian backs up your drives, partitions or volumes to a second drive for the purposes of disaster recovery—and it does a great job. You can restore individual files from the copied drive, referred to as the DPSR (Data Protection/System Recovery) drive. The drive you’re protecting is referred to as the Source drive. Of course, the DPSR drive must be at least as large as the Source drive. This program worked extremely well, and the slim manual is a model of clarity and conciseness. Technical support was also superb. I had some problems because of an old BIOS that required translation software to use large drives. Because it’s difficult to purchase IDE drives below 20GB, and older BIOSs require tranlation software for large drives, note that you can’t use translation software on the DPSR drive. For my test, I used an SCSI drive as the DPSR drive, which required a fair amount of reconfiguration. I was able to recover deleted files from the DPSR drive. With an up-to-date configuration, though, System Guardian’s real strength came through. When I unplugged the Source drive from my computer, I was able to boot back to DOS and my Windows 2000 server directly from the DPSR drive, recovering all the contents of the protected partitions. 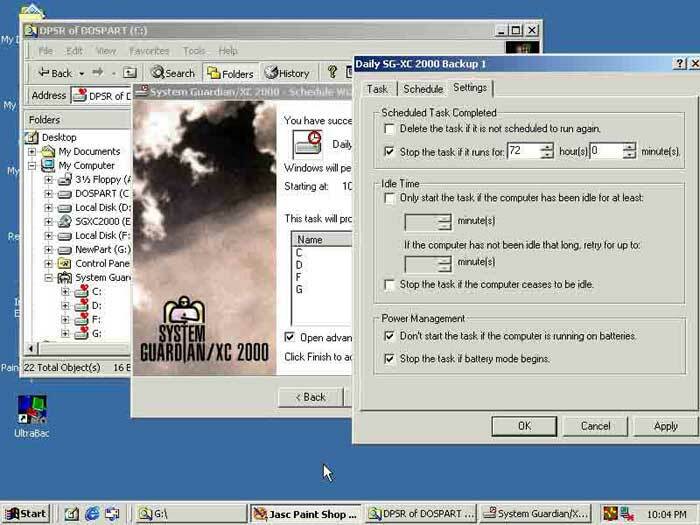 XC/2000 runs on Win2K or XP. One key advantage of XC/2000 is that you may continue to use the computer as you would normally—the updates to the DPSR are done transparently. You can’t back up the second drive to tape; instead you may swap the DPSR drive to a second computer, boot the DPSR drive, then back up that drive to tape. With the DuoCor-recommended mobile racks for all drives, this becomes easy. The configuration wizard runs automatically after installation, or you can use it later to revise your configuration by selecting Source drives | DPSR drives | volume(s) to back up. The schedule wizard lets you choose back up interval, time and date to start, as well as an account to manage the scheduler service. The XC/2000 interface resembles Windows Explorer. Files on the DPSR drive have hearts next to them; various other icons next to the file names indicate upon which drive the file exists or if the files are of a different size or time stamp. Items on the Tool menu let you choose what kind of back up or restore you wish—fast, full volume and so on. Because of the way XC/2000 works, the manual lists certain obvious logical consequences as warnings. For example, files that are only on the Source drive are removed when restoring volumes, while files that are only on the DPSR drive are removed when backing up volumes. Other competitors include some of System Guardian’s functionality, but none (to my knowledge) is designed to be used as real-time backup. PowerQuest’s Drive Image 5.0 doesn’t allow you to update individual file (delete or addition) unless you re-create the image, unlike System Guardian, which sends only changes to the DPSR drive. Further, DriveImage doesn’t transfer Write Only changes to the copied image, though the included DataKeeper functionality comes close if you’re willing to select specific files or volumes. For this functionality of real-time back up, with scheduled updates, System Guardian XC/2000 works extremely well. Douglas Mechaber, MCSE, MCNE, CCDA, is a network consultant and dive instructor and is always on the lookout for utilities that make his life easier, or panulirus interruptus, the California spiny lobster.